In this blog post we would like to discuss how to plan a music video in order to reduce the video production costs. When first thinking about your music video concept or idea, it is easy to get carried away by grand ideas. In reality grand ideas ask for grand budgets. Present day superstar musicians spend budgets equal to those of small indie movies – all that for a single music video. But not everyone realises the amount of money that goes into some of these music video productions. On the other hand the music video field has many examples of creative and interesting videos which clearly have been made with reasonable and affordable budgets, but still look fresh, eye-catching and interesting. The key here is concept. When planning a budget music video production, try to develop a concept that does not require involvement of many locations, many actors, a lot of sophisticated shots that require special equipment etc etc. In the example video below (the Sweet Surrender music video), CineEye (the music video production company) focused the video around the band members as they are not only great musicians but also very capable performers. Sweet Surrender also has a sort of gothic and alternative vibe about it, so we chose to shoot in locations which translate that feel into visual imagery. Location planning is another aspect you have to think about when preparing to shoot a budget music video. For Sweet Surrender’s music video CineEye shot everything in one location, but in different rooms. Therefore the travelling cost was reduced to minimum. This is something we would advise every musician looking for an affordable music video – think about a concept that can be shot in one or two locations which are close to each other. And remember – choose locations that will have that special visual feel as the look of the environment is immensely important for any video. Equipment level and crew size is another component that can increase or diminish video production budget considerably. The crew filming Sweet Surrender’s video consisted of 2 people – director of photography/cinematographer, an assistant cameraman and a general assistant. We did need at least this amount of people as we used large 4k setup, slider and other grip equipment. Another video production company would probably use even more people as not everyone is flexible about these matters. So you can see that even a small production like this can be relatively people intensive and is more hard to handle than one might think. This is something to remember when you are budgeting your music video. Shoot length is also something you should bear in mind when planning a budget music video. It is not always easy to evaluate the time needed, but as an approximation we can say that any video involving more than one location most probably cannot be shot during less then 1 full day. The more locations, the longer the shoot. There are other aspects that increase the amount of time that will be needed for the shoot, but locations are probably the most significant one. The Sweet Surrender video took us one full day to shoot. As a matter of fact we would be happy to shoot even longer if the project circumstances would allow that. If your music video is story based and requires involvement of actors, extras, dancers or other talent be ready to increase your budget. Alternatively you can invite your friends and family to take part, but be careful and make sure you choose people based on their talents and not based on their relationship to you. As Sweet Surrender video was focused around the band itself and main character was played by the front-woman Anna, we could reduce the overall budget considerably as no other artists were contracted. As beautiful you may think you and your bandmates are, there is a high chance that you would be more beautiful wearing a bit of makeup and thinking carefully about your wardrobe during a video shoot. Unless of course a “no style” is the style you prefer and a natural look is your signature look. In Sweet Surrender’s case we could reduce the cost of video production even slightly more as they took care about their own makeup, wardrobe as well as props. 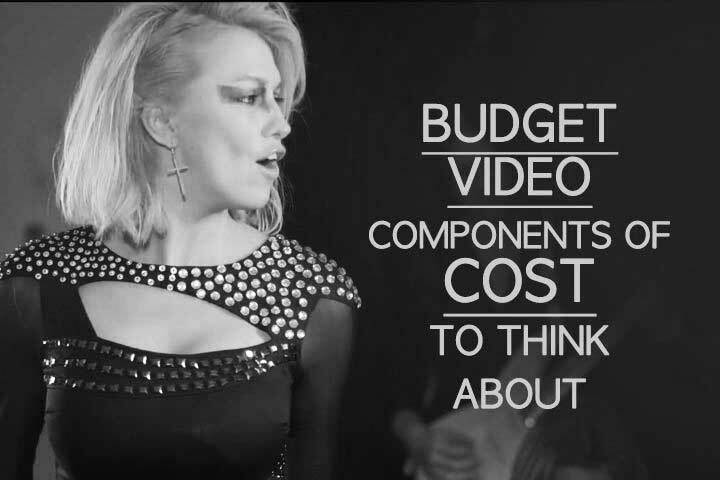 There are some main aspects every musician looking for a budget music video should think about when planning the video budget. Start with a concept that is easy to implement and will not require high level equipment (e.g. cranes etc). A tight concept will also reduce the time needed to complete shooting. Also think about reducing the amount of locations that you need to shoot in. The smaller amount of locations, the less money spent on travelling and the less time spent for shooting/travelling. And lastly – if you want another option to reduce the overall cost of your music video, choose to take care about your makeup, wardrobe and props yourself. Good article about the concept of low budget music video. Thanks a lot for sharing. It will help me a lot as I am going to shoot my own video soon. Keep up the great work. Thanks for sharing this, some brilliant tips. Cool video by the way. I especially like the use of focus and blur. What kind of camera did you use for making this video? Thanks for your good words. We used Blackmagic URSA mini 4.6K camera, although the “focus and blur” effect primarily depends on the type of lenses one uses. Thank you for sharing these tips! I’m a bit confused regarding my next music video. But now I feel I can do it better (looking for advice was how I stumbled upon your post).